Studio Print Night provides access to our beautiful, fully-equipped space to work independently on a printing project. 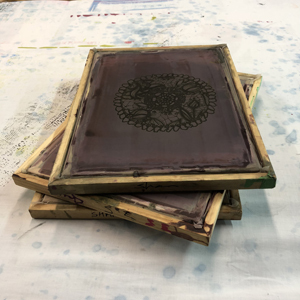 Past students, or artists/craftmakers with screen printing experience, work in a self directed manner with feedback and technical assistance from a knowledgeable instructor. This session is ideal for brushing up on skills, completing a project from a previous class, or as production time. Students must provide their own screens, pigments, extender, fabrics, and a squeegee.